Nestled wonderfully in the beautiful stretch of the sparkling Thar Desert, Jodhpur is one of the significant tourist places in Rajasthan. It has gained fame across the world on account of its historical monuments, ancient temples and natural sites. Today, it is one of those few must-visit places without which your trip to Rajasthan would be deemed incomplete. It is the second largest city in the state and has something for every kind of tourist. From nature lovers to adventure seekers and history enthusiasts to campers, it allures everyone. Therefore, it witnesses travellers in millions every year. But despite the fact that it is one of the most popular and visited places in India, there are still several things about Jodhpur many tourists are unaware of. So, let's move ahead and learn more about these interesting facts related to Jodhpur. If you have ever been a student of Indian history, then you might have read that Jodhpur is called the blue city of India. But did you ever wonder why it is called so? If not, then let us tell you that Jodhpur has a maximum number of houses painted blue, which were coloured so in order to distinguish between the Brahmins and other castes and these blue houses referred to the houses of Brahmins. Today, Jodhpur is mostly recognised amongst tourists for its shining blue expanse. Generally, it is taught that Jodhpur was founded in the late 15th century by a Rajput chief, Rao Jodha, who was also the founder of the Marwar region. However, it is certainly not true. As per ancient Hindu texts, it is said that the settlement of Jodhpur dates back to thousands of years when the region was inhabited by the Ahirs. Therefore, it wouldn't be wrong to say that Jodhpur is one of the oldest living places in Rajasthan. How can a trip to Rajasthan be complete without savouring its luscious and lip-smacking local dishes? Jodhpur has been the origin of several local dishes of the state. The list includes mirchi vada, mawa ki kachori, dal bati churma, bajre ka sagra, atte ka halwa and gatte ki sabzi. It is also known for producing several delicious desserts, such as malpua, besan ki barfi and ghevar. So, each and every foodie out there, add Jodhpur to your bucket list now. It is none less than heaven for you guys. Built in the late 15th century by Rao Jodha, the founder of Jodhpur, Mehrangarh Fort is located atop a rocky hill at an elevation of about 410 ft, and hence it is often referred to as one of the impregnable forts in India. On account of its strong bastions, thick walls and huge doors, it would be perfectly fine to say that Mehrangarh Fort is one of the strongest forts in the country. Today, it is one of the most-visited monuments in Rajasthan. If you are an ardent lover of history, then you shouldn't miss out on exploring its history and grandeur. It is a known fact that the region in and around Jodhpur faces drought once every four years. But do you know why? Well, as per local legends, it is said that after a hermit named Cheeria Nathji, who used to live on the hill where the fort is built, was forced to move by Rao Jodha, he cursed the entire kingdom with water scarcity. Since then, once every 3-4 years, the city and its surrounding region have been facing drought. 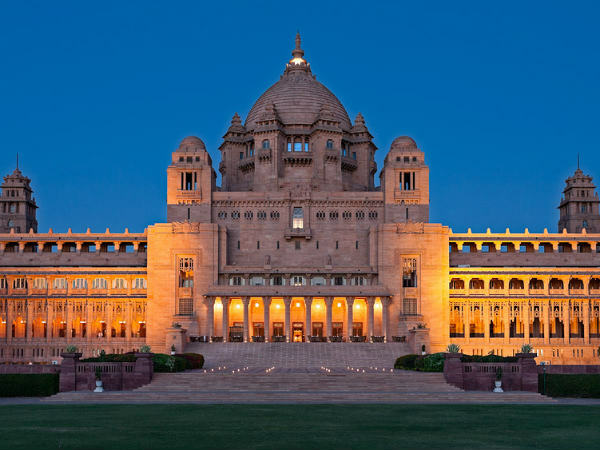 Located in Jodhpur, Umaid Bhawan Palace is one of the largest and most expensive heritage hotels in the world. Recently, it has been voted as the world's best hotel. From all modern amenities to a paradisal atmosphere, this architecturally-built palace provides its visitors with everything. It was built in the year 1943 and is also the private residence of the royal family of Jodhpur. So, what do you think about paying a visit to this wondrous beauty and experiencing royalty within its boundaries?